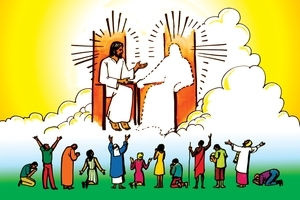 Outline: (Dialogue) Jesus taught His disciples after His resurrection and then went back to Heaven where He is now. He will come again. Those who don't follow Jesus will be punished forever. Testimony of what Jesus means to someone. Prayer to receive Christ. How to grow as a Christian. Don't wait to follow Jesus. (Monologue) Jesus taught His disciples, then went to Heaven. Jesus will return and take people who believe in Him to Heaven, those who don't believe in Him will be punished forever. Jesus died so we could go to Heaven. Jesus took our punishment. Follow only God, leave your sins. Decide for Christ today.